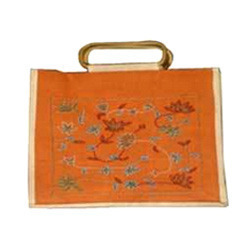 Manufacturer of a wide range of products which include printed jute beaded bags and handmade jute beaded bag. We have established ourselves as a leading manufacturer, exporter and supplier of an exclusive range of Printed Jute Beaded Bags. To comply with the latest trends, we use high quality jute to fabricate these bags. These bags are perfect for every occasion and have good storage capacity. Beautiful in look, these Printed Jute Beaded Bags are available in various customized designs, colors and sizes and offered by us at the market leading price. We pay a lot of attention to achieve the satisfaction of our clients by manufacturing and exporting Handmade Jute Beaded Bag. These bags are fabricated by using high quality jute sourced from the most reliable and authentic vendors of the market. 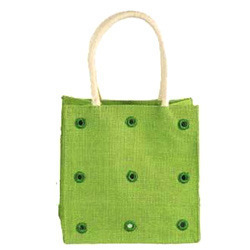 Designed for shopping purposes, our Handmade Jute Beaded Bag is spacious enough to carry all necessary items. To suit the various requirements of our clients, we provide these bags with customized size, design and color specifications.